Over the last month we’ve been reading, analyzing, and honing in on the most vibrant conversations taking place in the Working Groups. 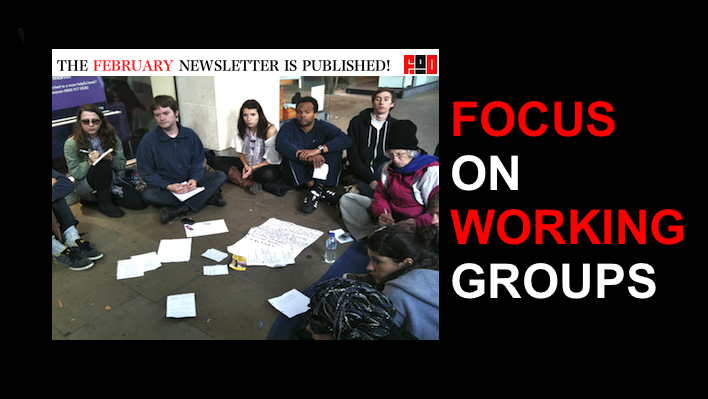 Our February issue, the ‘Focus on Working Groups‘ presents you with a number of blogs and essays highlighting exciting strategic ideas, specific proposals, and LOTS MORE bubbling up from the WGs. It is our hope that they will catalyze the cross-fertilization of innovative practices and ideas between the WGs, and evoke your comments and news that can benefit all of us! Read also about why we’ve started these monthly newsletters here. ← Can Occupy occupy strategy?